MANILA ― While the world is increasing sanctions on North Korea's Kim Jong-un regime, a global campaign is raising awareness of the need for unification of the two Koreas. Moon Hyun-jin, chairman of the U.S.-based civic group Global Peace Foundation (GPF), believes it is important to make it relevant to as many people as possible throughout the world to realize the goal. Based on this belief, he created an initiative for a unification song campaign and had tens of thousands of civic activists participate in his movement. Action for Korea United (AKU), a civic alliance of over 850 NGOs, launched the One-K Global Campaign Organizing Committee in 2015 and released a song that promotes Korean unification made by Grammy-winning producers Jimmy Jam and Terry Lewis, Friday. "I wanted to make sure unification is an issue that is accessible to young people and wanted them to begin to realize it is something they need to construct," Moon, the biggest sponsor of the campaign, told The Korea Times at the Marriott Hotel in Manila, Tuesday. The 47-year-old civic group leader, based in Seattle, visited Manila to attend the GPF-hosted five-day global peace conference and a concert organized by the One-K campaign committee. He plans to support the committee to embark on a global tour, which could be a stage for possible follow-up unification songs. In the concert featuring K-pop idols, audiences responded enthusiastically to the song which delivers a message of universal values such as peace and unity. "Music is the best way to transcend regardless of differences of country, culture, ethnicity, or race. It's universal. You can present a simple idea and message in a framework that anyone can understand," Moon said, when asked why he advocates the song campaign in his unification movement. "I put my bet on this. I know it is human nature that if you are interested in something you definitely want to learn more about it." He showed confidence that the Korean wave, or hallyu, on the global stage can be an effective tool to raise awareness of the situation of the Korean Peninsula, and that it will eventually encourage action from apathetic young people. "Imagine some of the top figures young people idolize talk about the importance of unification. You don't think kids in America, Europe, Africa, Asia all of a sudden want to know about Korean unification? You don't think kids won't study those lyrics?" he said. "Imagine how great that will be for the Korean people. How inspiring that will be for all the cynics who don't believe in unification in Korea to know that you have foreigners who believe more in the importance of unification?" In the recording of the unification song, tentatively named "One Korea," K-pop singers are expected to be joined by foreign artists like Grammy-awarded R&B singer Peabo Bryson. London-based Metropolis Studios said it is scheduled to distribute the song by the end of March. "It's just starting but we moved the bar from complete apathy to actually being interested," he said. Moon established the GPF in 2009 and initiated the civic-led movement for unification the following year. He has claimed the unification of the two Koreas can only be realized through people power not by government-led moves. "Democracy, its people move and then the government follows. There's an issue that I face not only in Korea but also in every Asian nation: the belief that to make things happen it's the government that has to move," he said. In that sense, he credited the AKU initiative himself. Under Moon's leadership, the coalition of civic groups was launched with 327 civic groups in 2012 in a bid to unite their unification work. It grew to include over 850 civic groups from liberal to conservative camps, drawing much attention. "This is a huge achievement. We brought together all significant civic bodies that actually do engage with the North, brought them under one umbrella," Moon said, noting the biggest problem in civic movements in South Korea was that all parties were fragmented from agenda differences. He also viewed it as a reason the liberal governments' engagement policy toward the North did not have a fruitful outcome. "As long as you have a body like AKU you are going to have a continual effort that transcends administrations. Once North Korea opens again, this time everything we did wrong under the Sunshine Policy we will have things put in place and make significant changes." Moon said his efforts in the unification initiative are part of his inheriting the "family legacy." His grandfather's brother was a prominent member of the Korean anti-colonial movement, for which he helped draft the Independence Declaration. His father, Moon Sun-myung was at the forefront of engagement with North Korea starting in 1991. After meeting the North's founding leader Kim Il-sung in Pyongyang that year, Moon Sun-myung established the international company Mt. Geumgang in 1994, launched tours there in 1998, and the following year established Pyeonghwa Motors _ a joint car venture between South and North Korea. His third son Hyun-jin pioneered his own path of unification movement by spurring civic movement and also by promoting the philosophy of "Hongik Ingan." 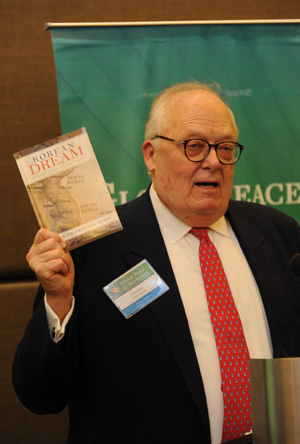 The ancient Korean mantra that is devoted to the "welfare of mankind" is well-articulated in his recently published book, "Korean Dream: A Vision for a Unified Korea." Father of Tangun, credited with founding the country, is believed to come to this world to serve the people, not to rule over them or demand they respect or worship him. Serving the people is the notion that can resonate among people in the world, Moon says. "Korea embarked and created an ideal nation that uplifted fundamental human rights and freedoms and tried to establish a people-based government. This sounds astounding to foreigners because of the belief that this was purely a westerners' construct," he said. "As we enter the pan-Pacific realm where Asia is trying to find its own identity and establish its own sense of leadership, this is so relevant. "It basically represents the end of the colonial and Cold War era. Through unification you close the chapter on that, and open up a new chapter that leadership of Korea and Korea's story."